Jim starlin,s dread star comes to tee vee at last . But hoo will be dread star ? How about Corey Feldman ? And gorgeous Gigi as willow ! And David Hubbard as doc Delphi , Arnold vosloo as high lord papal ! I don’t know what Jim’s position with Dynamite is, I don’t know what Dynamite’s situation is with its franchised properties or, the Atlas-Seaboard trademark was ‘assigned’ to Dynamite but don’t know what the situation is with the Atlas-Seaboard properties ……..
…….. is it possible for Jim to use the Atlas-Seaboard properties, reclaim the Defiant, Broadway and Daring Comics and use them to augment Dynamite into a single universe? It would be great if Shooter could land somewhere in his own company that he controls, without all the previous backstabbing crap he’s had to put up with in the past. And, you know, with a passable budget that could compete with the big companies’ ever diminishing rates. My preference would be (really for any new company) that Shooter would publish a rotating series of mini-series. Each mini-series would be self-contained stories that would essentially be viewed as standalone movies, and can be collected into graphic novel format. Each title can be revisited for other adventures under the same format. This helps to bypass the potential problems with ongoing series, where sales traditionally diminish over time. These standalone mini-series can be an excellent way to build a superhero universe. After a time, the more popular characters/titles can potentially become ongoing series. I live in NC and would love to see you at the Charlotte HeroesCon. Have you ever been offered or considered coming here. I live in Asheboro and travel about an hour and a half to the Con when there are great artists and writers. You are on my bucket list! I used to be a huge fanzine collector and wish I hadn’t sold most of them off as a few had actual art (!) you had done from back in the day. Anyway, love to see you and hope you and yours are doing fine. If you plan an ‘old guys’ company, can I come along to run TV and movie licensing? I’d like to get back at all the movie mogul brainacs who threw me out of their offices in the 70s and 80s telling me movies based on comic characters would never work and the theaters would be dark after 6PM. Alice Donenfeld was V.P. of business affairs and company counsel for Marvel during much of my time there. I refer to her often in my posts, maybe not always by name. She was a Godsend to me, tremendous help during the W4H crisis and others. She was a voice of reason, clarity and sanity, and Lord, I needed one. Alice was instrumental in so many great things that got accomplished while she was at Marvel. Three that leap to mind are the Dazzler film opportunity, the Handbook of the Marvel Universe and the quest for creators’ rights. There are many more. If ever I rant about “upstairs people” who never opened a comic book, believe me, I’m not talking about Alice. Alice, you’re the best. Your comment all by itself got my wheels turning. It makes me feel like rising up and striving again. Thanks. Cave Dreams, by the way, is enthralling. You write with grace and sincerity. I wasn’t surprised. Anybody reading this, please go to Amazon and check out Cave Dreams, a novel, written by Alice. It’s a romance. But isn’t everything that’s good? There are others. Check them all out. After I read the others I’ll give you a book report. Thanks again, Alice. Be well. Rising and striving sounds like a good plan to me, Jim! There has to be a way to take all the changes in the internet, printing, fundraising, etc. that have come about since the turn of the century and use them to your advantage in a way that wasn’t available to you in the ’90s. I noticed Rob Liefeld had a Kickstarter for a comic book in 2013 that met his fundraising goal. The only problem is he still hasn’t finished drawing the comic book three years later. Yikes! The nice thing about Kickstarter is you get the money upfront and the funders expect there to be a delay in delivery of the product that could take a year or so. But generally not three years! Comic books are more collaborative than a novel but if you could put the right team together with the right artist, you could create something that could please all your old fans and catch the eyes of new readers alike. And if it takes off, you could expand the line with a new generation of creators being trained in the traditional storytelling lessons that are being lost in the modern era. I have a friend who never even read comics but has been fascinated with reading your blog and watching interviews with you talking about all the dramatic ups and downs you’ve had in your comics career. Stories that have a basis in reality tend to have the most weight and resonance. So using some of these personal life events for inspiration could lead to something that feels new and fresh. God knows you’ve been through enough professional conflicts to inspire countless slugfests! Thinking more about the “older superhero comes out of retirement” angle, it could be interesting to see the classic origin story of an original superhero told in parallel to a story of him being forced out of retirement to fight in a much more modern and brutal battle than he ever faced before. You could even use different art styles for the parallel vintage and modern adventures. There’s the possibility for all kinds of subtle commentary on how the comics medium and superheroes themselves have evolved in the past 50 years. And this could create a springboard for a new universe which could tell stories in several different time periods that utilize art styles reminiscent of each era. That’s just a very skeletal sketch of an idea, and not exactly a 100% original one, but I’ll be happy to sell it to you for an autographed copy of issue #1! Like Alan Moore’s Supreme! It worked brilliantly. Jim should pull a “Space Cowboys” or an “Expendables,” get together all the old-time creators that no one will hire anymore and launch a Kickstarter to start a new comics company. It’d be interesting to see how much of the 1980s Marvel bullpen or the original Valiant staff that he could reassemble under one roof. The superheroes don’t have to be senior citizens themselves, but aging superheroes is a good concept that hasn’t been done to death yet. If you start an “old guys” comic, I’ll gladly come along and be a reader! 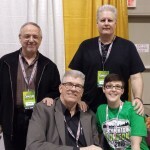 As someone who is working on starting a comic publishing company, Jim Shooter is an inspiration. Marvel needs another Jiom Shooter to come in right now, and bust heads. The sad thing is that no one will hire him even though he’s quite desperately needed. What wood u look for in a super heroe group ? Like the flash ! & a black guy hooz allways talking trash ! Hoo can be giving his frends a ride . And a red headed girl hoo levitates 2 the other side ! And a kung fu master & a master of disskyze ! Let,s call this group : Scott Rockwell,s lunatic fringe ! Her dad from terrorist , but she did not suckseed. She noze a Jamaican cook hoo is immune 2 flames . A evil Russian sykick is the dude hoo is 2 blame ! Can give his frends a ride. A South American reporter has a force field & can tellyport . Allan black creates magic cards & can escape from any fort . Skye Channing touches things 2 know just wair thay bin . But are these enough super powers 2 let these sykicks win ? Thair is a book called captain marvel , and thair is a captain marvel in A book called shazam! Marvel never had a book called star watchers . But thay hassuld Jim shooter out of duing a book called star watchers ! But shouldn’t it have bin d.c. B-cuz jack Kirby,s kamandi by d.c. Mentioned the star watchers ! So will the new valiant ever du story’s about ravenrock ? Enjoyed meeting Mr. Shooter today at Tampa Bay Con. Loved hearing his stories about various books. Jim needs to write a memoir! It is too bad Jim was not sought after by Mirage Studios (Ninja Turtles) as their company was ramping up around the same time he left Marvel. I wish Jim could come and save marvel. That’s a great article. Thanks for the link! There’s another article on that website about Steve Gerber. It covers his entire history with Marvel. It goes into his firing and the Howard the Duck lawsuit in exhaustive detail. Most of it seems based on company correspondence and the court records. I’d love to know what Jim thinks.